Concrete pump clamp is one of our typical carbon steel investment castings. They are made by lost wax casing process, all types of concrete pump clamp can be produced according to the client’s requirements. Also forged concrete pump clamp can be provided. The material of our concrete pump clamps is normally carbon steel but it can be adjusted. After casting, zinc coating or paint will be done. The types of our concrete pump pipe clamp are the following: grooved, heavy duty, metric, 1 bolt and 2 bolt in both adjustable and non-adjustable. Mn-13 carbon steel, C35, C40, etc. 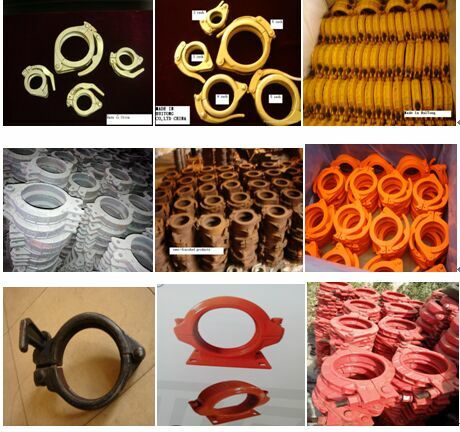 We also produce custom concrete pump clamp according to customers’ drawings or samples.